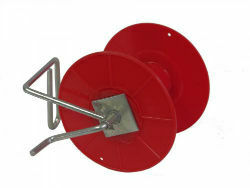 Use to recover electric fence wire, polywire or polytape. Complete with spool. Capacity—22 lbs. of steel wire or 1/4 mile of polywire.